It’s been a long time since I wrote a branching out post, partly because I haven’t tried anything new for a while! Way back in September when we went to Yarndale, I bought some undyed Merino yarn with the intention of trying out dyeing it myself. Over the last few months, I’ve read blogs about dyeing and watched YouTube videos but never really had a good chunk of time that I could devote to it uninterrupted. Until now, when the children have been at school/preschool and I haven’t. 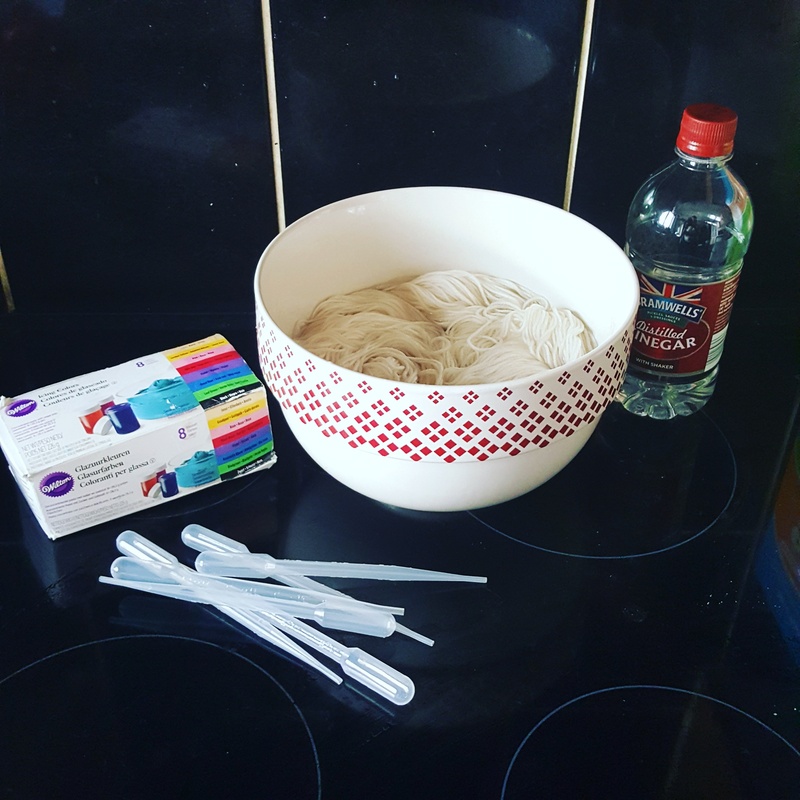 I’d already ordered the ‘kit’, I got some pipettes from eBay, bought white vinegar and had some Wilton food colourings in the baking cupboard. 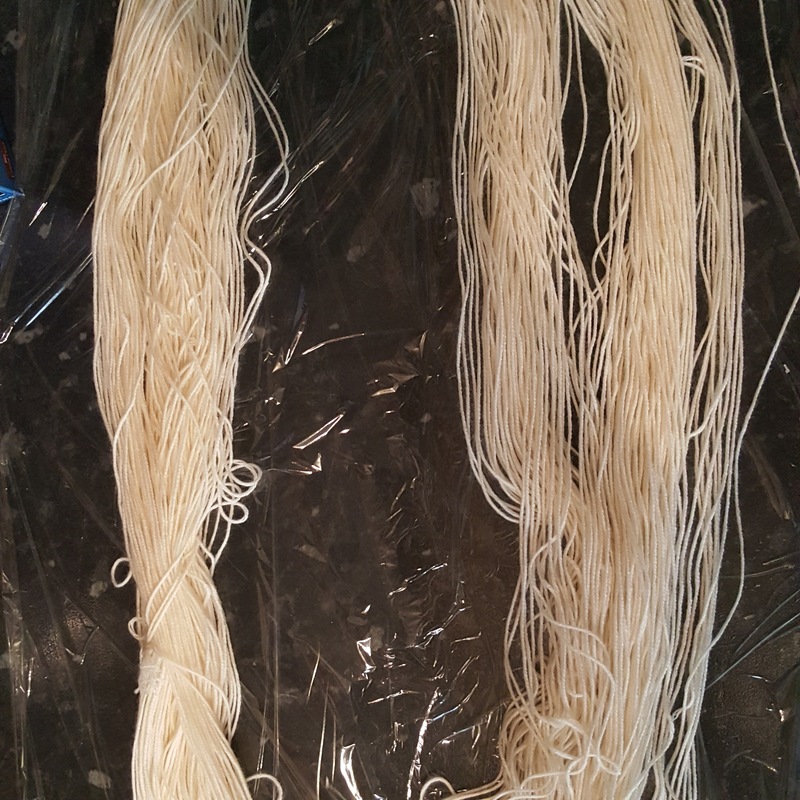 I will confess to feeling really quite nervous as I plunged my skein of yarn (which cost the best part of £10) into the vinegar and water solution. I had to just tell myself that all hand dyed yarn is unique and therefore into didn’t really matter what it looked like! 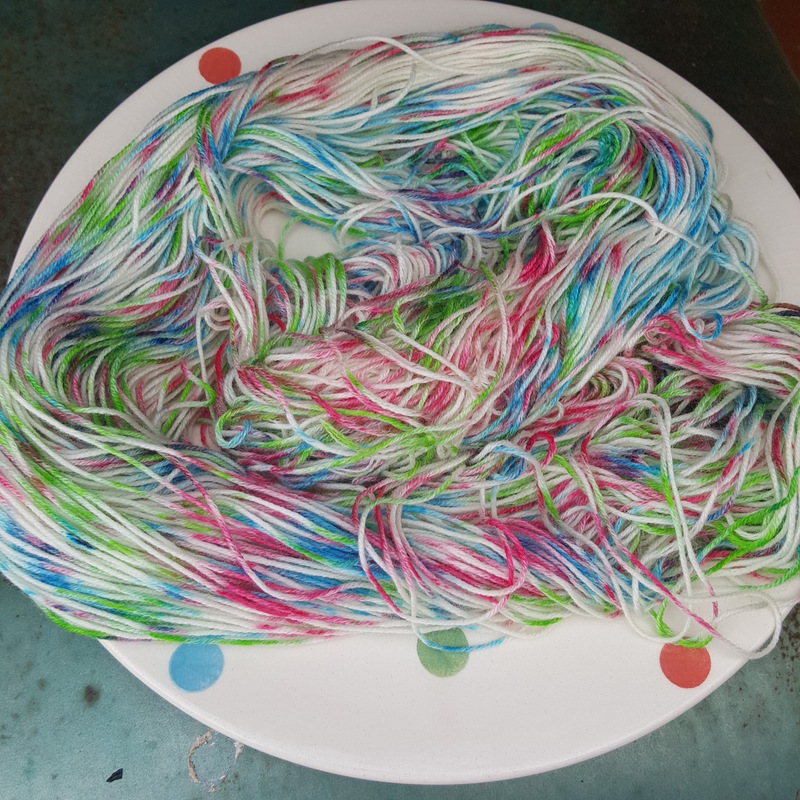 A fellow yarn addict, who I met at a party, had informed me that the purple Wilton dye doesn’t work well on yarn so I mixed up a solution each of pink, green and blue. After a good few hours soaking, it was time to lay it out on the cling film and start adding the colour. I was aiming for a speckled look rather than dyeing it fully, and I watched several more YouTube videos whilst I was waiting for the yarn to be ready. Once it had cooled, I made up a cool water solution of baby shampoo and gently washed the yarn. I was really careful to make sure it was all at the same temperature-having got this far I didn’t want to felt it now! I then hung it to dry on the airing rack and left it overnight. At this point it was very pleasing to see that the pink and blue had mixed in places to give me my coveted purple! 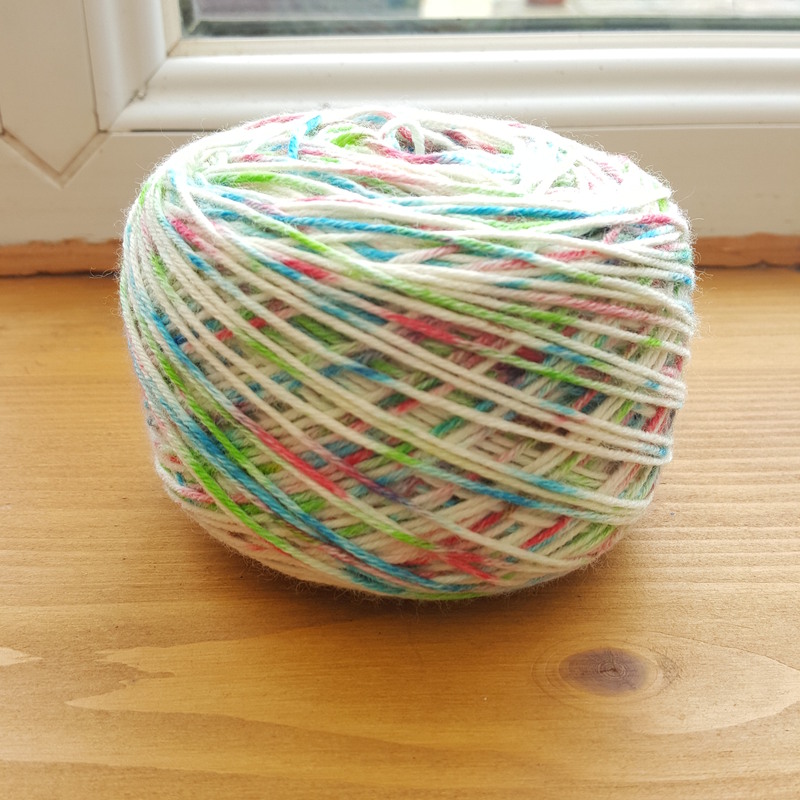 The next day I tackled turning the skein into a ball, a fairly new experience for me and also a fairly challenging one. My parents in law’s dog looked bemused as I was taking care of him and battling a big pile of yarn spaghetti. I managed to wind it all (nearly 300m) without having to snip a knot out even once. Have you ever tried yarn dyeing? How did it go? Let me know! Wow! It looks shop bought! Brilliant 🎂🎂 Any thoughts on what you might create with your unique yarn? Thank you, I think that’s the thing about hand dyeing, it’s all unique. I’m sure it must take a lot of skill to make several the same though! I’m thinking of a knitting rather than crochet project but that’s as far as I’ve got. 100g is enough for socks, or maybe a small scarf/shawl. I’ll treasure it to just look at whilst I decide! There are some llamas at the other end of the village lol. I’ll put it to the committee! You can’t beat a good challenge 😂😂 oh dear, now I’ll have to think of something! Thank you, I appreciate the process more now and what dyers actually do to get their end result. I’ve no idea what I’ll do with it apart from look at it, I do think the colours are pretty. It might make a nice scarf, shawl of cowl. I wrote down the amounts of dye etc so if I got the same yarn I could reproduce the amounts of colours, it’d still be random though. I have thought about it but haven’t pulled the trigger on buying the supplies. Every time I see someone’s hand dyed yarn, it makes me want to do it too 🙂 I love yours! Thank you, I’ve a feeling it could be addictive! Wow, that turned out well! I would not have guessed that you hand dyed it yourself. I’ve never considered trying it before, but now I am. Thank you, I promise it’s fun, but messy and smelly too! I’ll keep that in mind if I ever do get around to trying it! That looks so professional!! The colour scheme is great too, so fresh and pretty. This is proper crafting! Thank you, I keep having ideas for other colour schemes now ! That is lovely and must be such a satisfying feeling! I like the idea of organic dyes, and I’ve read quite a bit about them. I think they’re something I’ll try out too, but maybe with mini skeins too. I’ve seen solar dyeing and that looks really good too, using plants/flowers. Maybe you can tag me in those posts, don’t wanna miss them! It sounds fun. I don’t have a lot of room in my apartment to get messy. Have you tried making yarn out of t-shirts? Those colors are beautiful! I laughed about Mr. C not being impressed with the smell. Sounds like Chicken Grandad when I make salsa! Just wondering ….. do you spin your own yarn also? I always think that sounds like a relaxing thing to do if I could get the coordination down. We used to have sheep and I always thought it would be fun to try spinning. The carding looked like a lot of work but maybe it isn’t so bad? I haven’t processed any fibre, but I tried carding at a national trust property and it was quite hard. I bought a braid of dyed fibre that I just predrafted for spinning. I must do some more as I have a spindle full but nothing to ply it with. I thought the carding looked hard when I saw it at an old time vendor thing. 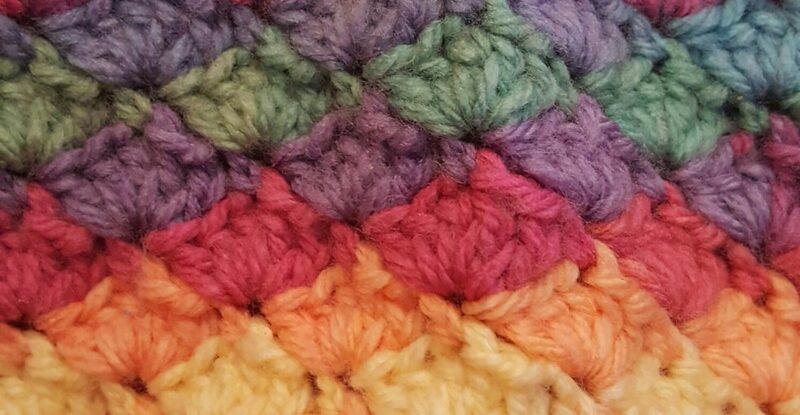 I’ve dyed fabric but being new to crochet, haven’t tried it yet. I do have whole drawer full of fabric dye though, I wonder if it would work?! The last time it was used was by my cat who decided her white fur needed to be hot pink. Maybe I’ll hold off a little longer, lol! Yours looks amazing though and you make it look easy. I’m just glad I can’t smell the process through your site 😉. Haha, I didn’t make it sound very appealing did I? It might work, you could be a dyeing pioneer! Your birthday cake is very very pretty. But the real prize was achieving something new. Thank you, you’re right, I do love to learn new things as well as working on improving old skills. I don’t suppose you have any tips for turning a skein into a ball? I had a go last night and got in a TERRIBLE mess. I’ve got two more skeins to go, so I think I’ll give the airer a try! I’d love to hear if it works. Good luck! What a great project, and I love the name of your new yarn! Thank you, it really is fun! Wow what great results you achieved. I love the colours and cannot wait to see what you will make with it. I tried, natural products (flowers, veg etc) on embroidery floss many years ago. Unfortunately most of the things I tried, looked lovely until they dried and then just seemed to turn an unappealing brown colour. I kept it for years, it took me so long to make, but then it ended up in the bin, as I knew all along it would never be used. Thank you, I like the idea of natural dyes but I really wanted the vibrant colours the food dyes produce. I quite fancy trying natural ones, but it’s a shame they fade. I bet beetroot works well! Thank you, I think I will knit with it rather than crochet. I just need a pattern that only uses 100g! Ooh that might take some choosing -I ‘d always for go for a teddy bear or toy of some kind, although a hat might fit the bill , is going to turn chilly next week ! I’m not sure I can knit that fast 😂😂 but a hat might be nice for next winter. Thank you, I think I’ll enjoy using it, when I find the perfect project! Wow! That is beautiful! Well done, I’d love to see how it works up, I bet it will make a gorgeous project! Do you have anything in mind for it yet? Still no ideas, but I’ve got plenty of WIPs to deal with so I’ve got a bit of browsing time. I’ll be scared to use it in case I don’t love the projec! I think I would be too, it will have to be the perfect project! 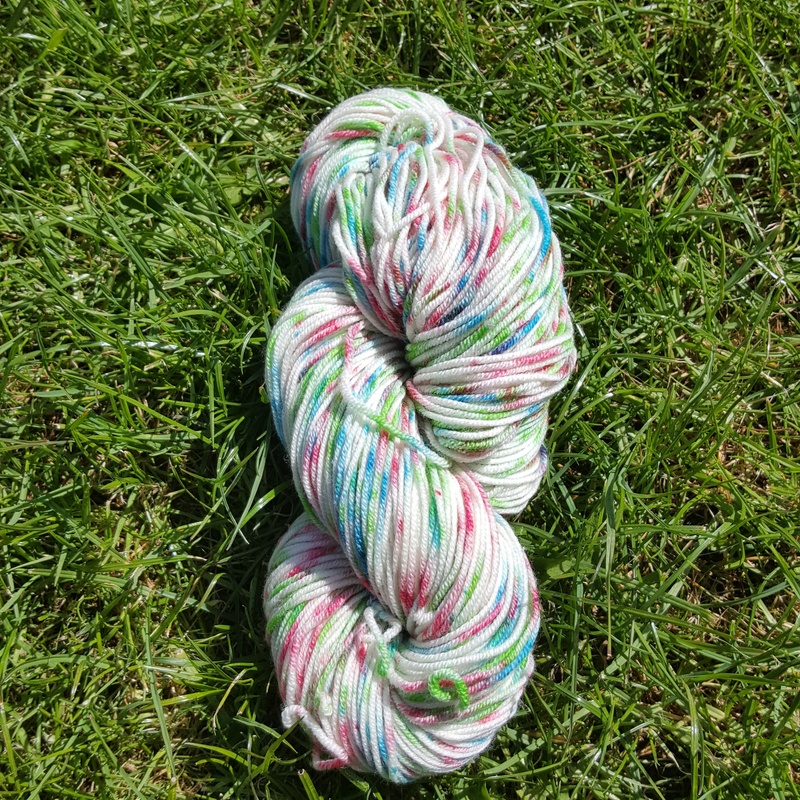 Ooh lovely blog post and lovely looking yarn too. Well done. Hey, wouldn’t that be pretty spaghetti – hope the children weren’t disappointed in the real spaghetti ! Thank you so much, I remember having a tie dye top in the late 1990s! Your dyed yarn looks fabulous! Can’t wait to see what you create with it. So beautiful! I am now tying to convince boyfriend and my best friend that we should try this during the summer. Do you have any specific videos that you watched?